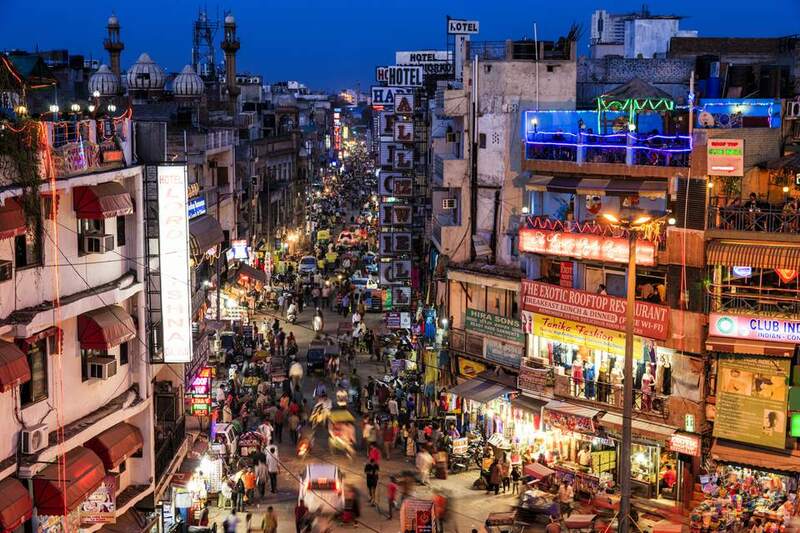 Dehli's Paharganj, once considered a hippie haven and seedy backpacker district is evolving. These days, even middle-class Indians are heading there for its bargain shopping, and inexpensive places to eat and drink. Here's the pick of bars and restaurants in Paharganj's Main Bazaar. The traveler's hangout, Kitchen Cafe Roof Top is a funky place with a soothing East Asian feel. It has a fantastic, central location right in the middle of the Main Bazaar. The outdoor space is filled with plants and cane furniture. Coffee lovers will appreciate the real Espresso Italian coffee. There's a pool table too. And, the best thing, it never closes! Address: Hotel Shelton, 5043 Main Bazaar, Paharganj, Delhi. Phone: (11) 2358-9371. Also conveniently located in the middle of the Main Bazaar, Everest Kitchen has an ideal rooftop location that affords panoramic views over the action. It's especially atmospheric at sunset. The restaurant has a chilled out mountain vibe, with a shelf full of books, fluttering Tibetan prayer flags, and lots of greenery. The Nepali owners serve up a diverse variety of cuisine including Indian, Nepali, Tibetan, and Italian. Address: Hotel Lord Krishna, 1171-1175, Main Bazaar, Paharganj, Delhi. Phone: (11) 2356-1456. Opening Hours: 8.30 a.m. to 11 p.m. The Metropolis Bar and Restaurant, located on the rooftop of the Metropolis Tourist Home, is a landmark Paharganj eatery that's been in business for more than 30 years. It’s a little more costly than most (prices have skyrocketed in recent years) but the quality and variety of food is a definite step up from the usual suspects. The ambiance is great too, with a dose of old-world charm. Both Indian and western dishes are prepared, including wood-fired pizza. Service is friendly, fast, and efficient. Address: Metropolis Tourist Home, 1634 Main Bazaar, Paharganj, Delhi. Phone: (11) 2356-1782. Opening Hours: 8 a.m. until 11 p.m.
A relatively new entrant on the scene, Sam's Restaurant, and Bar opened in 2013. It's a more upmarket and formal establishment than longstanding Sam's Cafe on the rooftop, which attracts the standard motley assortment of travelers. Yet, it's still really reasonably priced (including alcohol). The menu is diverse, and the crowd includes many Indians on the weekend. Grab a beer and a table by the window, and enjoy watching the passing circus outside. Address: Vivek Hotel, 1534-1550 Main Bazaar, Paharganj, Delhi. Phone: (11) 2356-2902. Opening Hours: 12.30 p.m. to 12 a.m.
Another friendly rooftop restaurant with a view that's popular with travelers in Paharganj, this one is also located in the middle of the Main Bazaar, spread over two floors opposite Everest Kitchen. It serves a wide range of Tibetan, Chinese, Thai, Indian and Continental dishes. The building doesn't have an elevator so be prepared to climb four flights of stairs up! There's cold beer, soft cushions, and free wireless Internet available at the end of it though. Address: 4792 Main Bazaar, 6 Tooti Chowk, Paharganj, Delhi. Phone: 097179 61725 (cell). If you want to party on in Paharganj, My Bar is the best place to do so. This iconic bar opened in 2009 and was so successful that six more outlets have since sprung up across Delhi. Its aim is simple: to provide a decent bar environment and drinks at inexpensive prices. The interior has been recently renovated and given a hip new look. The crowd consists predominantly of fun-loving college students, interspersed with foreigners. Even young Indian women feel comfortable there. There are DJs on weekends. Address: 5136 Main Bazaar, opposite Imperial Cinema, near Rama Krishna Ashram Metro Station, Paharganj Delhi. Phone: 098990 75058 (cell). Opening Hours: 11 a.m. to 12.30 a.m.
Cavernous Gem Bar and Restaurant is another reliable option for a drink and evening out in Paharganj, and it won't blow your budget. The biggest draw is the live band that performs upstairs every night of the week. It can get loud and crowded, although the downstairs area remains more sedate. Address: 1050 Main Bazaar, Paharganj, Delhi. Phone: (11) 2358-8165. Opening Hours: 10 a.m. to 1 a.m. Need a break from yet another curry or ordinary traveler fare? Shim Tur is the answer! You can sample authentic, home-style South Korean food at this peaceful cafe, whose name means "take some rest". While backpacking through India 20 years ago, its Korean owner came up with the idea of opening a hidden restaurant that catered to other Korean backpackers. However, the secret is out, and it's become sought after by Indians and foreigners alike. Of course, this is not surprising because the food is darn good. Address: 2nd Floor, Navrang Guest House, 6 Tooti Galli, Main Bazaar, Paharganj, Delhi. Phone: 098103 86717 (cell). If you're craving some Delhi street food, head to Sita Ram Diwan Chand for a plate of chole bhature. This legendary hole-in-the-wall restaurant has been in business since the 1970s. Before that, the founder pushed a food cart around Paharganj for a couple of decades. The chole bhature is regarded as being among the best in Delhi. You can even get super soft bhature filled with paneer, and wash it all down with a lassi. The restaurant is always crowded and there's no seating space, so be prepared to stand and eat. It's situated in a lane off the Main Bazaar. Address: 2243 Rajguru Marg, Chuna Mandi, Paharganj, Delhi. Phone: (11) 2358-7380. Opening Hours: 8 a.m. to 6.30 p.m.
Not only does Open Hand ethically manufacture bespoke garments, but they also have cafes where you can get real Espresso coffee, hearty breakfasts, light European lunches, and yummy smoothies. The corridor-like cafe in Paharganj promises "a gentle ambiance, a subtle hint of sanity to prepare you for the next wild chapter in your travels". Who wouldn't welcome that! It also doubles as an art gallery. Address: 5090/T-452 (opposite Hotel Vishal) Main Bazaar, Paharganj, Delhi. In the lane towards Chabad House. Phone: 98719 08777 (cell). Opening Hours: 7 a.m. to 9 p.m. daily.